Perfect for outside waste storage, these 4 wheeled bins without a lockable lid are perfect for waste management requirements. Their 4 wheel castors and dimensions of H 1200 x W 1350 x D 770 mm enable you to manoeuvre through tight spaces with ease when transporting them from one location to another, minimising time and effort. The advantage of them being without a lockable lid is that they're sure not to catch the lock when depositing rubbish into them allowing for quick and easy waste disposal when opening the bins. 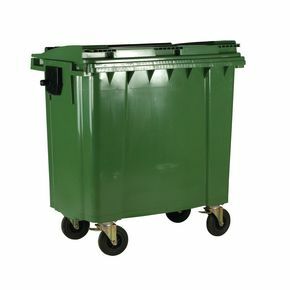 These bins are available in Blue, Green, Grey and Yellow; they are built to be tough and durable to ensure they have a longer life. The UV stabilised polyethylene prevents them from fading in exposure to sunlight. These 4 wheeled bins also benefit from a 12 month guarantee and are available for FREE next day delivery!